When Pop, our wonderful exchange student from Thailand, lived with us I became hooked on making curry pastes from scratch rather than buying the little bottles in the store. Pop is a terrific cook and spoiled us well with her delicious food! I took notes when she was cooking, and green curry paste was something she made fairly often. 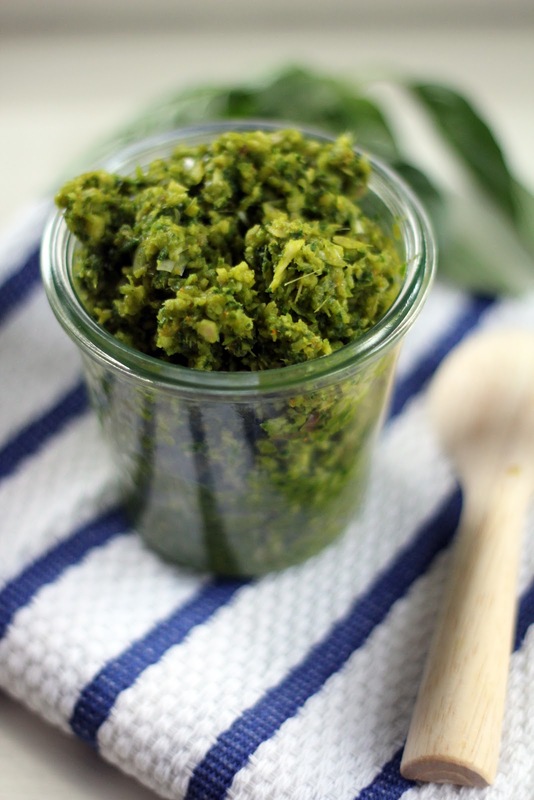 Fresh curry paste is vibrant and flavorful. By making your own, you can tweak the ingredients (I leave out the traditional shrimp paste) and the spice levels. No cooking is involved and it's a quick one to make. 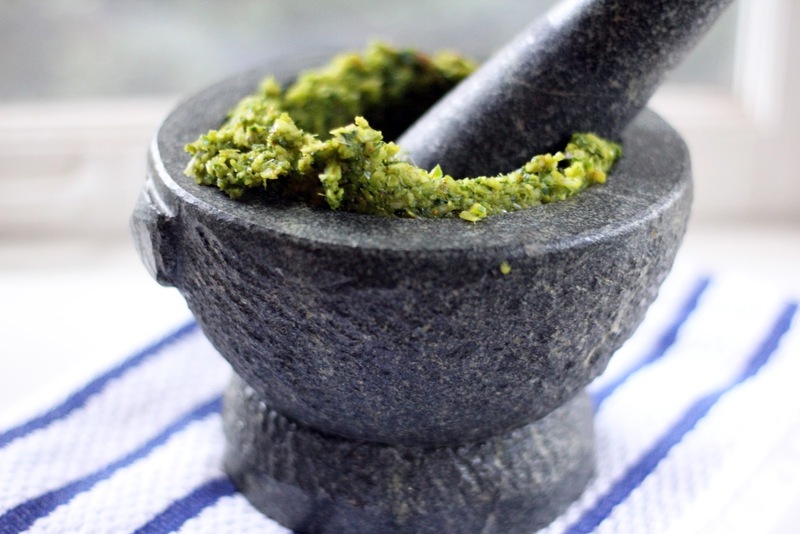 You can whiz the ingredients together in a food processor, or my favorite way is to use a mortar and pestle. This method takes time, and there is something quite satisfying about pounding away and creating the bright green paste. 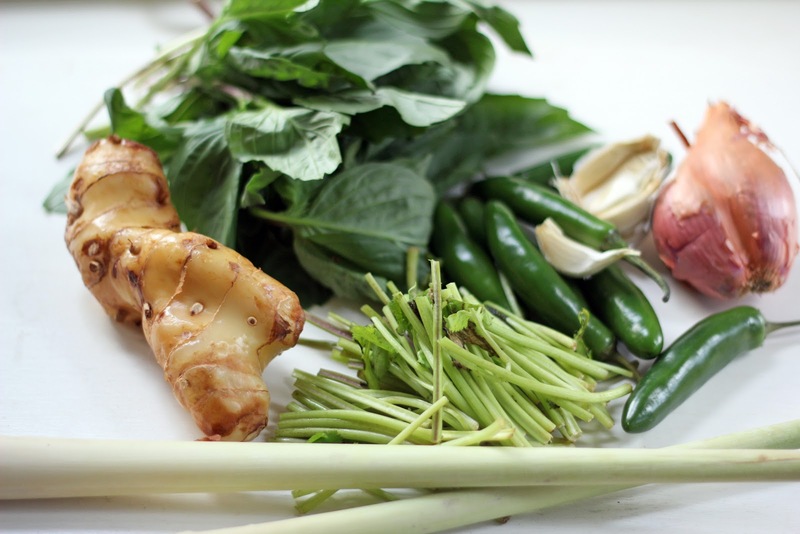 The lively scents of lemongrass, basil, cilantro, chiles and lime coming together are intoxicating. As I pound away, I inhale deeply, my spirits lift and I feel awake. My eyes water, too! When mixed with coconut milk and veggies, simmered and then ladled over rice, this curry paste transforms into a simple, spicy stew. It warms and soothes on a cold winter night when the snow is falling. 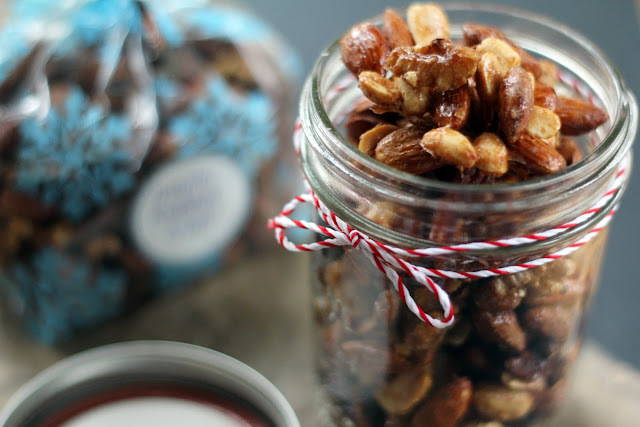 And if you’re looking for a unique gift to bring your hosts on New Year's Eve, just spoon some into a little jar with a ribbon around it. I wish you a happy, healthy, and delicious new year! Stir all the ingredients except the water the lemon juice together in a bowl. Depending upon the size of your mortar, you may need to make this in batches. Place your mortar on a folded kitchen towel to secure its base and protect your kitchen counter. 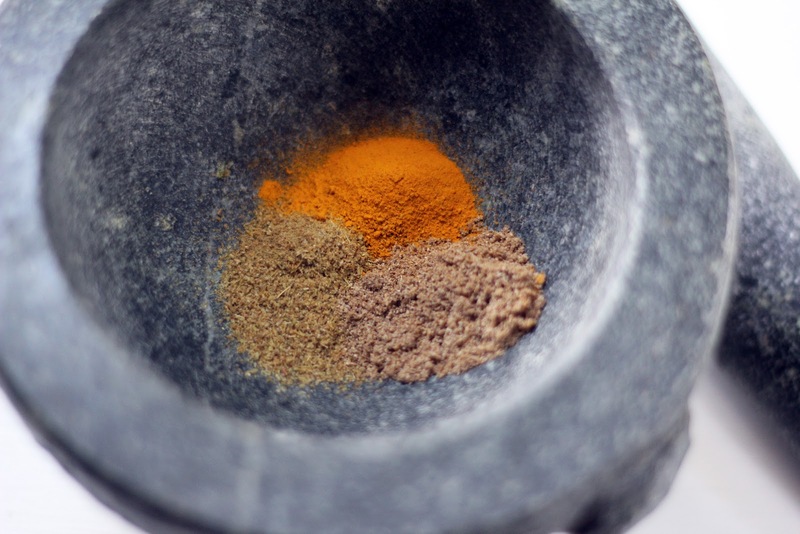 Scoop the spice and chile mix into the mortar and begin mashing with your pestle. Add a couple drops of water and lemon juice to moisten and help it come together. Continue mashing and bashing until a rough paste is formed. This may take about 15 minutes and will give you a bit of a workout. 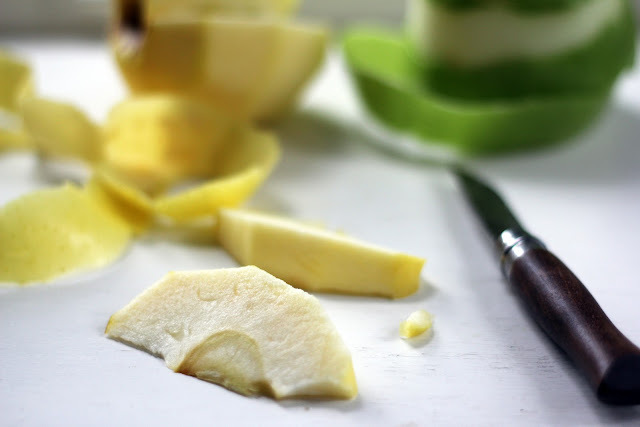 If you would prefer a quicker method, you can pulse the ingredients in a food processor until a rough paste forms, adding the water and lemon juice to help it come together. Scoop the paste into a jar and cover. The paste keeps well in the fridge for a couple of weeks or can be frozen, so it's great to make extra to have on hand. Cookie swaps are a happy thing. It’s fun to bake your favorite cookies to share with others, and in return indulge in a variety of other bakers’ family treats. 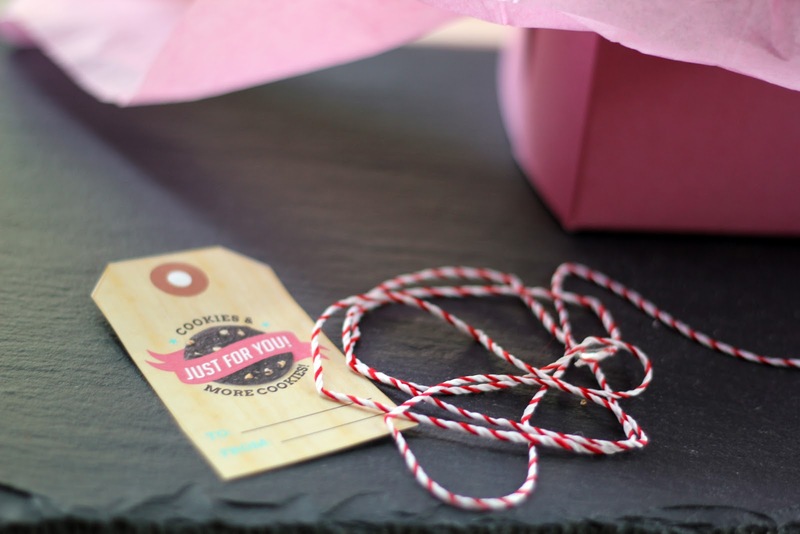 A holiday cookie swap tends to take place at school, in the office or within families or groups of friends. But today’s cookie exchange, The Great Food Blogger Cookie Swap, is between hundreds of food bloggers around the country! What a delicious way to discover terrific food blogs, new friends and to benefit Cookies for Kids Cancer. Deciding on which cookie to bake was simple ... molasses. Every time I bite into a molasses cookie, I’m reminded that this is indeed my favorite cookie (as well as Bob’s). 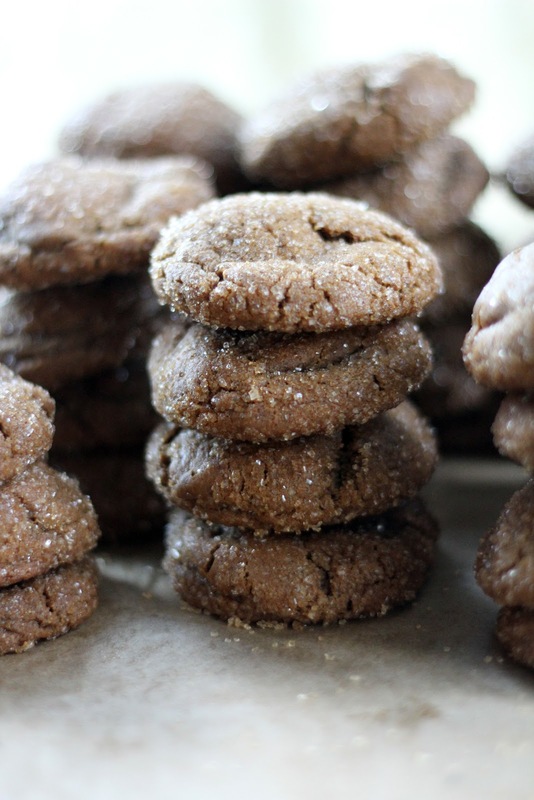 The combination of molasses and ginger never ceases to please me. I bake them often during this season, but rarely during the rest of the year, which really is a shame. 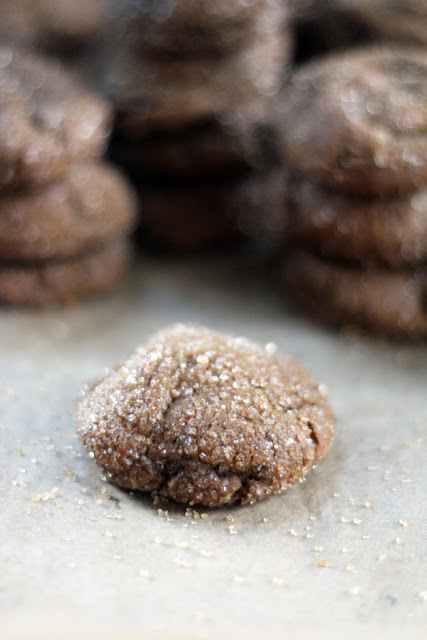 I should make that one of my New Year’s resolutions – bake more molasses cookies! Not only do these cookies evoke the flavors of this season, they travel well and stay fresh and delicious. I discovered this recipe in Cook’s Illustrated years ago. 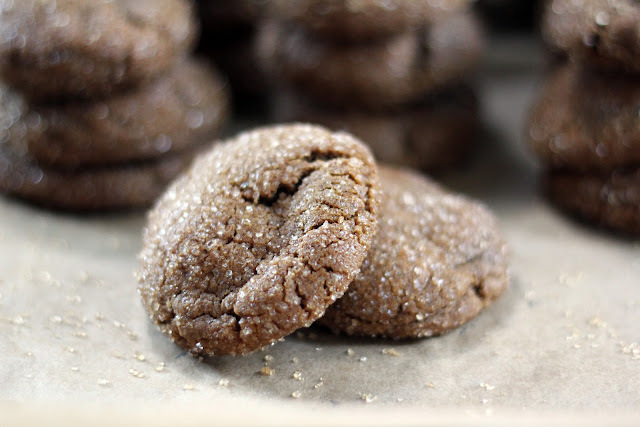 They bake into soft, thick cookies, with a strong molasses flavor and the warm spices of cinnamon, ginger, cloves and allspice. The secret ingredient, freshly ground pepper, is brilliant and adds a perfect little kick in each bite. I usually make a big batch of dough, scoop it into balls, roll them in sugar and freeze on a baking sheet. Then it’s easy to pop them in a plastic bag and stash in the freezer to bake at a moment’s notice. They never last long, though! We’ve already had scrumptious cookies arrive from Janet and Joanie, with more on the way from Catherine. Thank you! My family immediately pounced and began eating. We all appreciate the love and time that go into creating these luscious treats. It’s wonderful to share and connect in this way! I appreciate Lindsay and Julie hosting this lovely cookie exchange and am delighted to participate. If you’d like to join in next year’s swap, you can sign up here for more info. Happy cookie baking to you! Whisk the flour, baking soda, cinnamon, ginger, cloves, allspice, pepper and salt together in a mixing bowl and set aside. In the bowl of a standing mixer using the paddle attachment (you can also use an electric hand mixer and bowl), cream the butter, sugar and brown sugar together until light and fluffy. Add the egg yolk and vanilla and mix well. Reduce the speed to medium-low and add the molasses. Beat to mix in, scraping down the sides as necessary. Reduce the mixer speed to low and slowly add the flour mixture. Mix just until blended. Scrape down the sides. The cookie dough will be very soft. Line a baking sheet with parchment paper. Pour the turbinado sugar into a small bowl. Using a cookie scoop or tablespoon, drop individual scoops of dough on the baking sheet. Using your hands, quickly roll each scoop into a ball and then gently roll the ball in the bowl of sugar to coat. 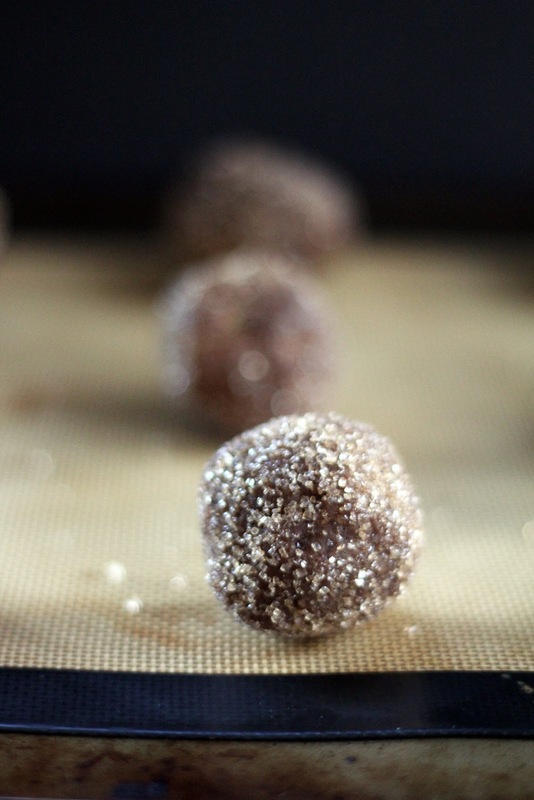 Replace the cookie balls on the baking sheet. When finished, cover the baking sheet with plastic wrap and stick it in the fridge for an hour (if you’re baking that day) or in the freezer (if planning ahead). When ready to bake, preheat the oven to 375 degrees. Remove the cookie dough from the fridge or freezer and place half the dough balls on another baking sheet lined with parchment. Space them evenly. Bake for about 11 minutes (12 minutes if baking frozen ones), until the cookies are puffy and the edges just set, but with a soft center. There will be some cracks and the inside may look a bit raw. Do not overbake – the cookies will firm up a bit as they cool. These are meant to be soft cookies. Let cool on the baking pan for 5 minutes before removing. Repeat baking with the remaining cookies. The cookies will keep well at room temperature for a week if well wrapped, or they freeze beautifully. Oil has been sizzling in the kitchen for the past few days, a sure sign that Hanukkah is here! It’s the time of year to light the hanukkiah and indulge in jelly-filled doughnuts and other fried treats. Latkes are, of course, on the menu many times during these eight days, providing ample opportunity to play with new ideas and recipes. Traditional latkes are made with grated potatoes and onions, and can be served with sour cream and/or applesauce. 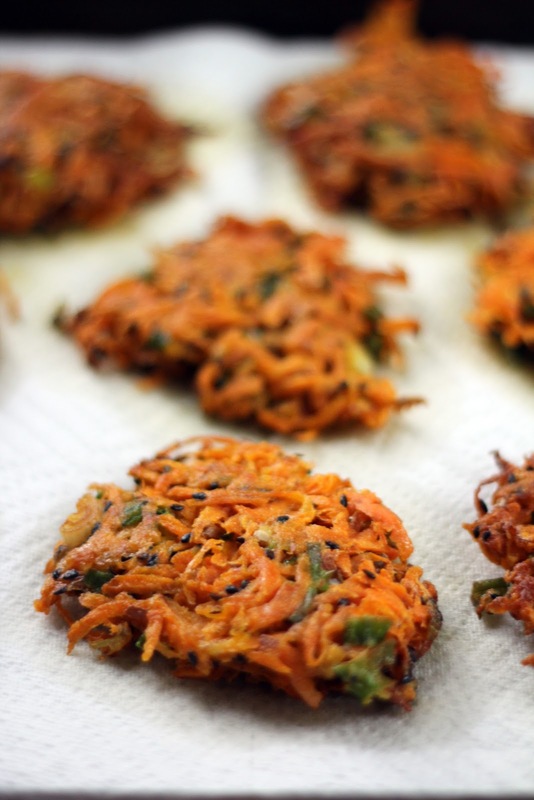 Over the years I’ve had latkes made with carrots, cabbage, zucchini, apples and even rutabagas. 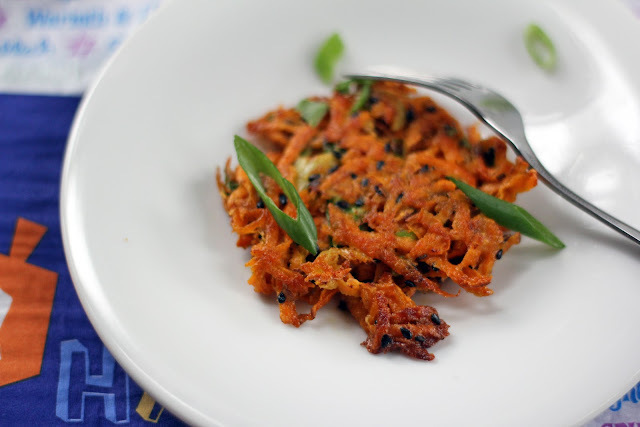 Basically, if you can grate it, you can make it into a latke! The idea is to grate the fruit or veggies, add seasoning, eggs and a bit of flour and then fry it all up into little pancakes. An oil-spattered stove and the lingering scent of frying are givens when making latkes and are all part of the fun. The mess is worth it, especially when you start nibbling. I want to share a new recipe with you that I put together for a latke party over this past weekend. The invitation said we should be creative, so I began pondering different ingredients. I adore sweet potatoes and still have many leftover from the massive bag I bought at Thanksgiving, so I knew they would be the basis. 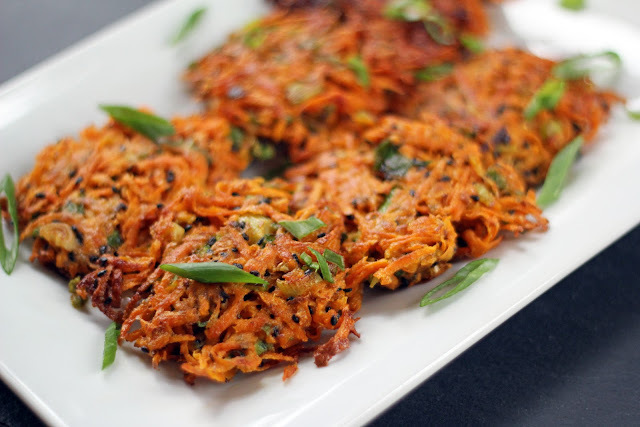 I’ve had delicious sweet potato latkes in the past which emphasized the sweetness of the potato. For this batch of latkes I wanted to move in a more savory direction, perhaps with a spicy kick. Freshly grated ginger provided the bite I was hoping for, along with some chopped green onions. A scattering of black sesame seeds rounded out the flavor. I usually hand grate the potatoes since I prefer this texture, but if you are frying latkes for a crowd then by all means use a food processor to make quick work of it. 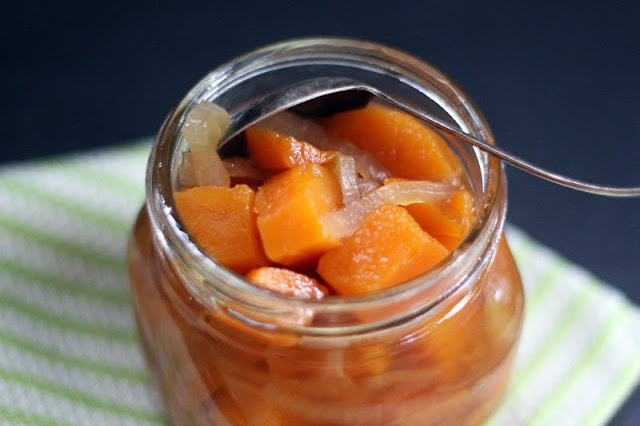 A nice benefit of using sweet potatoes is that they do not release as much liquid as white potatoes, saving yourself the added step of squeezing out the mixture multiple times. These speckled little orange pancakes fried up into tasty latkes with a little flavor punch, tender on the inside with lacy, crispy edges. And I’m delighted that they were enjoyed at the latke party! Using a box grater, grate the potatoes (I leave the peels on) into a large mixing bowl. Add the green onions, grated ginger, sesame seeds, flour and salt. Lightly toss with your fingers to mix. Pour in the eggs and use a wooden spoon to stir together. Line a rimmed baking sheet with paper towels. In a large frying pan, pour about 1/2 inch oil in and heat over medium-high heat. With a large tablespoon, gently place scoops of the potato mixture in the hot oil (the patties should measure about 2 1/2 inches across). Do not crowd the pan. Let the latkes cook for a few minutes until nicely browned before trying to flip (if you try to flip too soon, they will tear and stick to the bottom). When the edge of the latke lifts easily, gently flip it over (be careful for splatters). Fry on the other side until golden brown and crispy. Remove the latkes to the lined baking sheet to drain. Repeat the latke frying until potato mixture is used up. Adjust the heat as needed (may have to lower a bit if the oil gets too hot and edges start to burn a bit) and add additional oil as needed. Let the latkes drain, and then move them to a platter to serve. If you are making the latkes ahead of time, store them on paper towels at room temperature and then rewarm on a baking sheet before serving. As the days grow shorter and darker, I appreciate the twinkling lights of the holiday season - so cozy and cheery on these dark evenings! 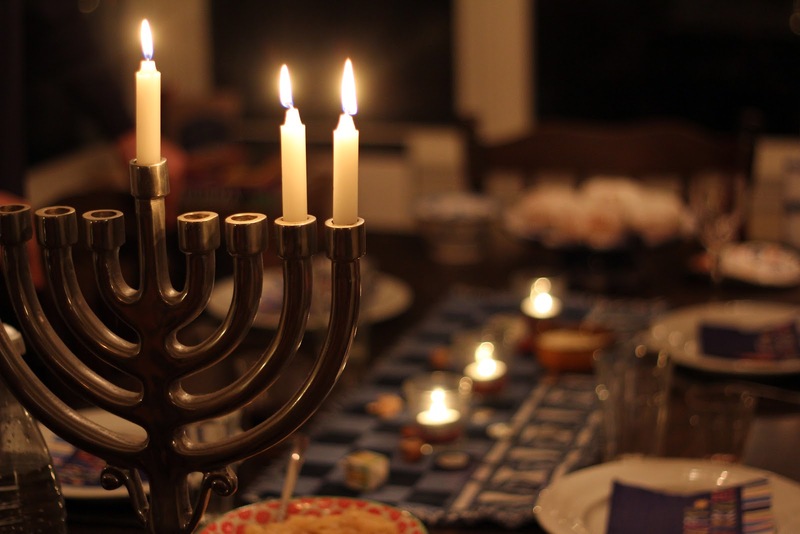 Hanukkah, the festival of lights, begins this weekend. I just pulled out my blue and white cake stand and our box of decorations. Time for lighting candles in the hanukkiah, spinning dreidels and, of course, festive food! During the eight days of Hanukkah, it’s customary to eat foods fried in oil such as latkes and sufganiyot (doughnuts). We will definitely indulge in lots of crisp deliciousness in this next week. Dairy, though, is also traditional for Hanukkah, especially dishes made with cheese. So it seems only fitting to eat konafa during Hanukkah. 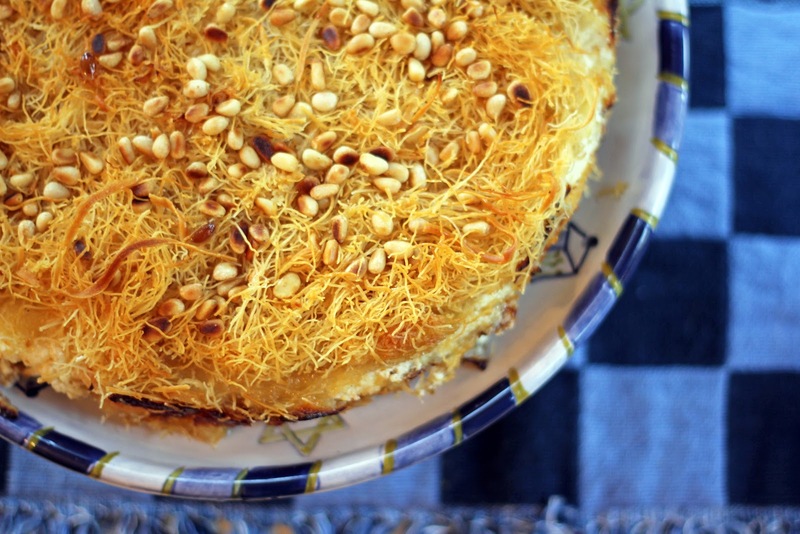 Konafa is a Middle Eastern cheesecake. It is popular in Israel, Egypt, Syria and Lebanon. There are a few different variations, but all use shredded phyllo dough as the crust. Some are filled with thickened cream and others with cheese. I prefer a variation using two fresh cheeses, ricotta and mozzarella, mixed together. 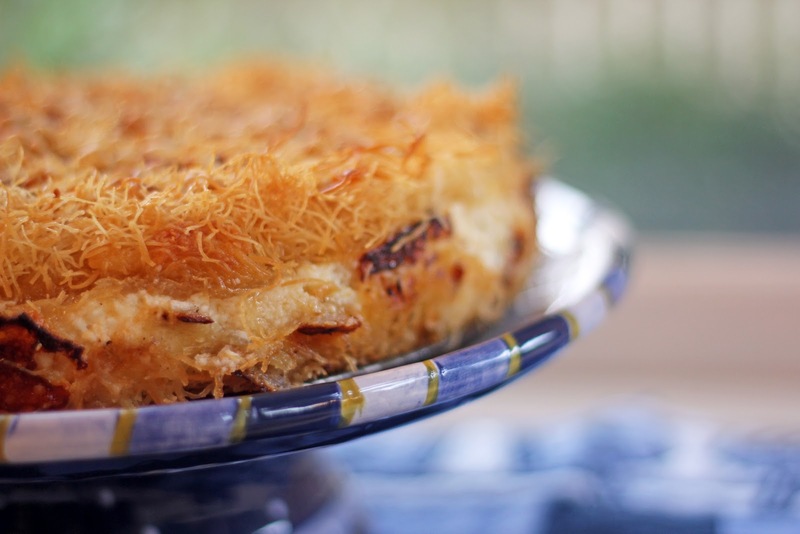 Claudia Roden inspired this version of konafa. Her book, The Book of Jewish Food, is a treasure of history, stories and recipes from all over the Middle East, Northern Africa and Europe. As with many Middle Eastern desserts, this one is sweetened with syrup. While the syrup is traditionally flavored with orange blossom or rose water, I chose to use lemon juice. Butter-drenched shredded phyllo dough is layered with the fresh cheeses, topped with more phyllo and then sweetened by pouring the syrup over while it is still hot from the oven. 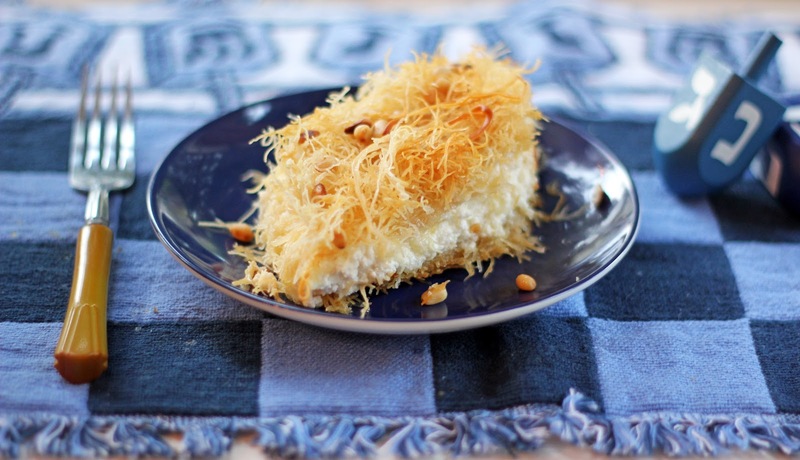 Think of a baklava-style dessert with a cheese filling, rather than ground nuts. This is unlike any traditional cheesecake you may have had before. If you have access to shredded phyllo dough (usually sold in Mediterranean markets and also called kataifi), then it is a snap to prepare. 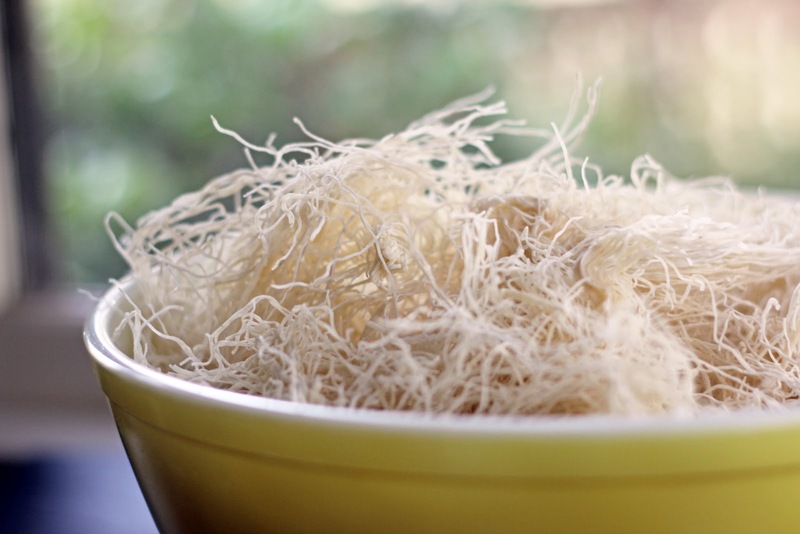 Shredded phyllo is much easier to work with than delicate sheets of phyllo. With your fingers, you gently work melted butter into the thin strands of dough. Place half in a pan, layer a mix of fresh ricotta and mozzarella over, and then top with the remaining dough. When the cake emerges hot from the oven, sugary syrup is poured over the top. 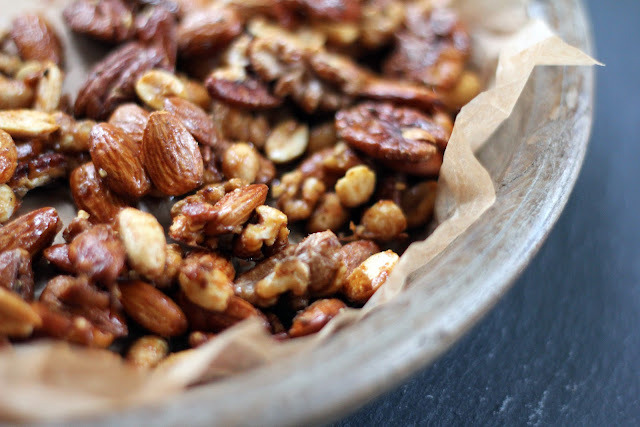 A sprinkling of nuts completes it. Served warm, with meltingly soft, rich cheese and crispy strands of sweet phyllo, this unique dessert will enhance a festive gathering any time of year. I can’t wait for Hanukkah to begin! Preheat the oven to 350 degrees. Wrap the bottom and sides of a spring form pan in foil and place on a rimmed baking sheet. Place the phyllo dough in a large mixing bowl and gently pull apart the strands. Pour the melted butter over and use your fingers to coat the strands. In another mixing bowl, stir together the ricotta and chopped mozzarella. Spread half of the buttered phyllo in the bottom of the spring form pan for form a bottom crust. Spoon the cheese mixture over and smooth evenly. Spread the remaining half of the phyllo over. Pop the spring form pan and baking sheet into the oven. Bake for about 45 minutes. Raise the oven temperature to 400 degrees and bake for another 10 minutes, until the top is nicely browned. While the cake is baking, make the syrup by mixing the sugar, water and lemon juice in a medium saucepan. Bring it to a boil, lower the heat and simmer for about 10 minutes, until it thickens a bit. Set aside. When the cheesecake comes out of the oven, pour the syrup evenly over the top and let sit for 10 minutes. 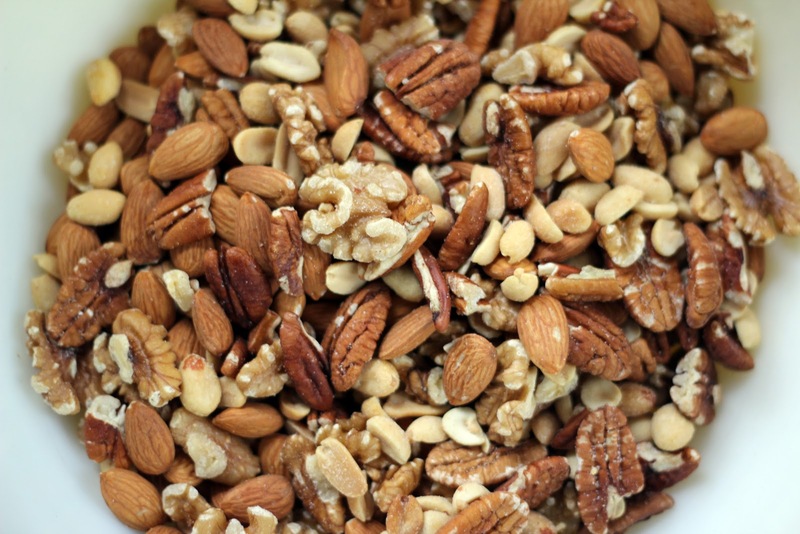 Sprinkle the nuts on top. 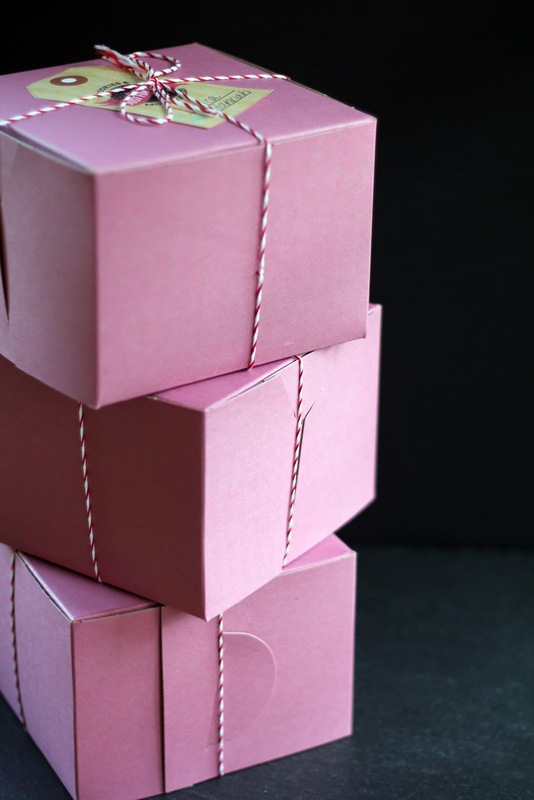 Use a sharp knife to loosen the edges of the cake and release the spring form pan. Slice into wedges and serve warm. The cake is best eaten the day it is baked. You can prepare the unbaked cake and syrup ahead of time.You can bake the cake closer to the time you'd like to serve it and then drizzle with syrup. When I started writing Blue Kale Road, part of my motivation was to compile family recipes for my boys, the recipes they are growing up with and may want to take with them. I guess it’s my way of passing down a treasure of 3x5 cards with handwritten recipes. Next year, Sam is going to college, and while he’ll be living in a dorm he may have access to a kitchen occasionally and want to make something homemade. My repertoire of favorite meals is on my mind now, simple food like meatloaf, veggie frittatas, roasted potatoes, lemon pepper chicken and glazed salmon – staples for our weeknights and dishes that in the coming months I want to include here. 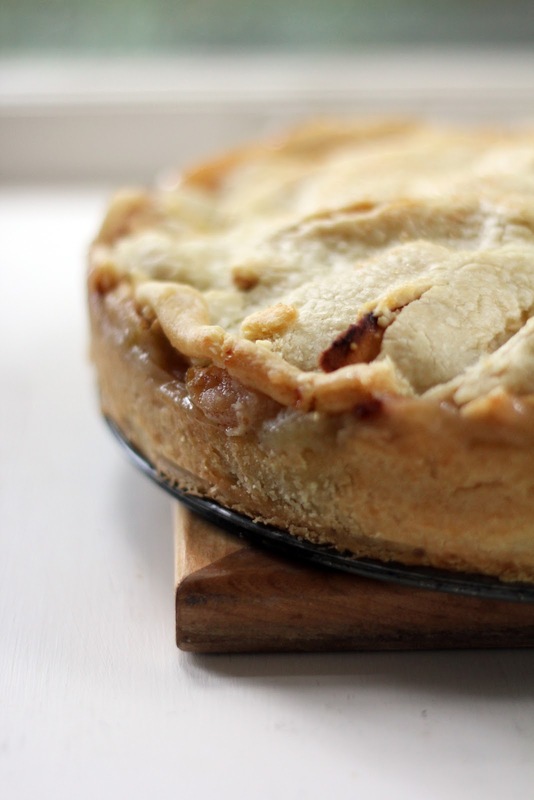 Today, though, is about apple pie. While not a regular part of our weekly eating, it is a favorite for Sam and Isaac (and Bob and me!) and a collection of Mom’s recipes wouldn’t be complete without it. As they say, many hands make light work and this was certainly true the night before Thanksgiving when my mother-in-law Mary, Sam, Isaac, Bob and I all gathered in our little kitchen together to peel and slice apples. We stayed up late chatting and laughing, while seeing who could get the longest strip of apple peel. This year, in preparing for major pie baking, I made my pie crusts ahead of time, rolled and arranged them in pie plates. I wrapped them up and popped them in the freezer, making it easy to assemble pumpkin, sweet potato and apple pies at the last minute. Since I was baking lots of pies for the holiday, I didn’t have enough pie plates for all of them at once and used a spring form pan for the apple pie. After tossing the apples with flour, sugar and a bit of cinnamon, I left them to macerate overnight since it was too late at night to bake the pie and I needed some sleep. In the morning, I pulled the crust from the freezer, poured the apples in and slid the pie into the oven. It couldn’t have been easier and I must say I loved the shape of the pie baked in the spring form and will continue to do it this way. I didn’t get a chance to take photos on Thanksgiving evening since we dove into the pies with gusto, so I had to bake another one. I know, it’s tough. 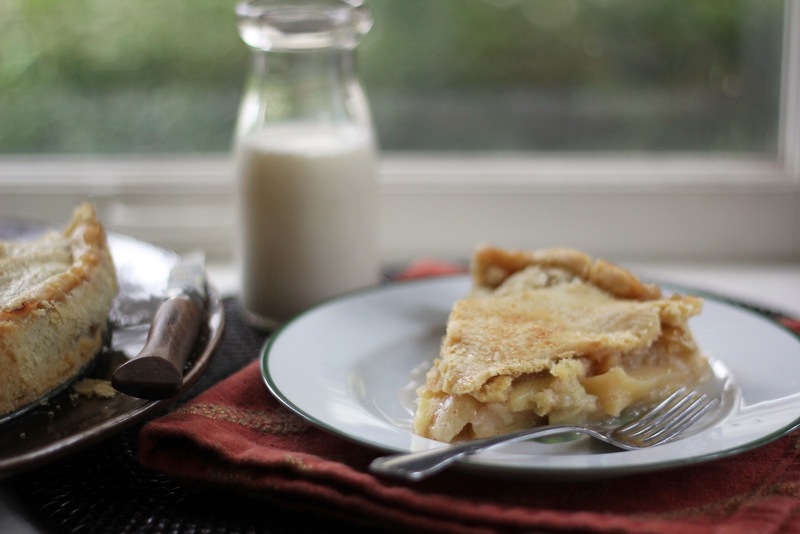 There’s nothing like greeting the boys after school with the heavenly scent of an apple pie just out of the oven! 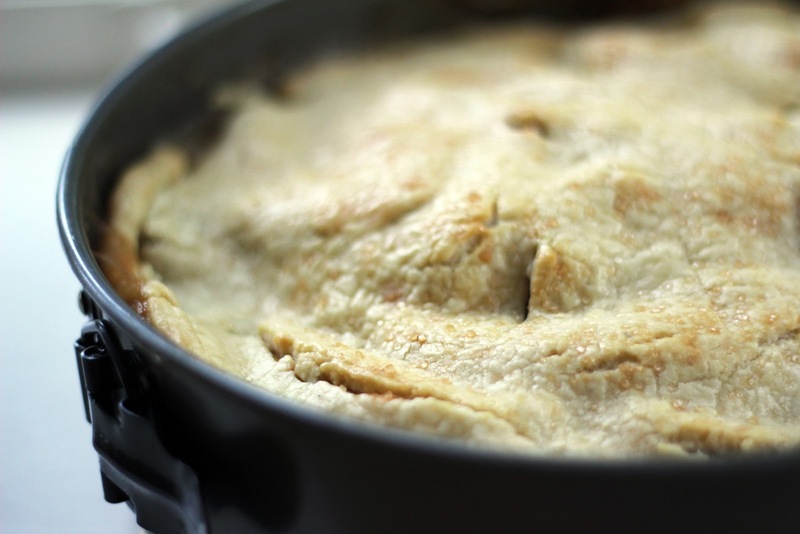 Is there anything more cozy and homey than apple pie? I don’t think so. 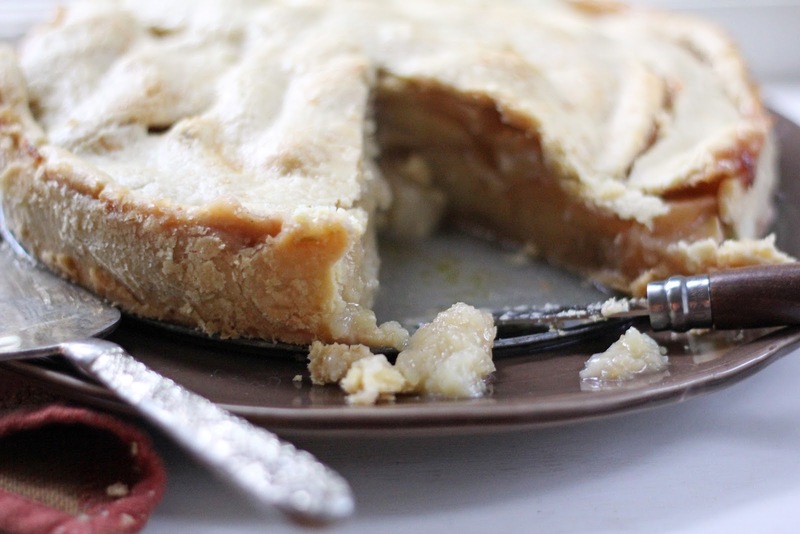 The flaky crust enveloped warm, soft apples that melted in our mouths. I enjoy apple pie as is, but a dollop of whipped cream would be welcome, too. If you want to try a creative twist on whipped cream, check out my friend Erina’s delightful curry whipped cream – it is a part of her winning dessert for Kitchen Circus, and I do think curry and apples pair nicely together. I hope Sam and Isaac will carry many happy memories from the kitchen, and perhaps having our family recipes at their fingertips will help them along the way. Have a spring form pan or pie plate ready. To make the crust, be sure your ingredients are well chilled. Rose Levy Berenbaum even suggests putting your flour in the freezer to chill before beginning and I’ve started doing it. Also, dice your butter and keep it in the fridge until ready to use. In the bowl of your food processor, pulse 2 1/2 cups flour with the salt a few times. Add the diced 1/2 pound (2 sticks) of butter and pulse until the butter resembles small peas. Add 3 tablespoons of ice water and pulse to see if the dough comes together. Pinch a small piece to test. If it still seems dry, add another tablespoon. When the dough comes together, turn it out onto your lightly floured counter. Gently form the dough into a ball and cut it in half. Using a rolling pin, roll one ball of dough into a round to fit your pan (if using a spring form, the dough should come up about 1 1/2 inches on the side). Fit the dough in, cover with plastic wrap and pop it in the freezer. Roll the second ball of dough into a ring to fit the top of the pie. Place it on a small cutting board, cover with plastic wrap and pop into the freezer on top of the spring form pan. You now have crust ready to use whenever you’d like! If you will be baking your pie right away, you can place the crusts in the fridge to chill until ready to use. In a large mixing bowl, combine the apple slices, sugar, cinnamon and remaining 2 tablespoons of flour. Toss to mix and coat the apples. Set aside to macerate for about an hour (or cover overnight). When ready to bake, preheat the oven to 350 degrees. Pull your crusts out (if from the freezer, pull the top crust out about 20 minutes earlier to give it time to soften a bit). Pour the apples and collected juiced into the pie pan and press/arrange the apples so they fit snugly. Dot the top with the remaining 2 tablespoons of butter. Lay the top crust on and seal the edges. Brush a bit of cream over the top to help brown and sprinkle a little turbinado sugar on top. With a small knife, cut a few slashes in the crust as steam vent. Place the pie on a rimmed baking sheet and pop it in the oven. Bake for about 1 hour, 20 minutes, until the apple filling is bubbling thickly and the top is browned nicely. Let cool for about half an hour to let the juices collect before serving. If desired, dollop with whipped cream or vanilla ice cream. I think apple pie is best served the day it is baked, but it certainly will keep well if made a day ahead and kept loosely covered at room temperature. I’m basking in warm sunshine (through the window) and a happy post-Thanksgiving glow. I am deeply grateful for our family members who traveled to spend the holiday with us and for our time gathered around the table sharing meals together. It was a warm, festive Thanksgiving weekend indeed. I hope you enjoyed the same! After indulging in a Thanksgiving feast, I find it’s time for some simple food. Perhaps because it’s eaten from a bowl, allowing you to cup your hands around it and inhale its warm scent, soup provides the ultimate nourishing comfort. Soup is soothing and fills you up without feeling heavy ... very welcome after lots of stuffing and pie. 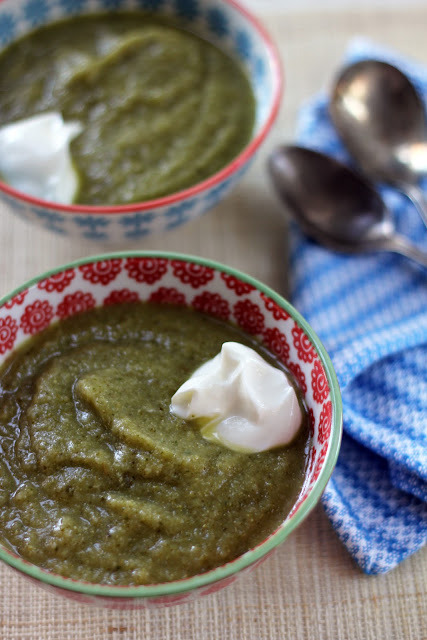 This Broccoli Apple Soup is beloved in our family and Isaac’s favorite. The original recipe comes from our dear friends, Ralph and Jane, two of the most nurturing, caring people I know. They would cook a pot of soup for you in a heartbeat! I’ve played with the recipe just a bit and it has even been mentioned in the NY Times. This is good soup. 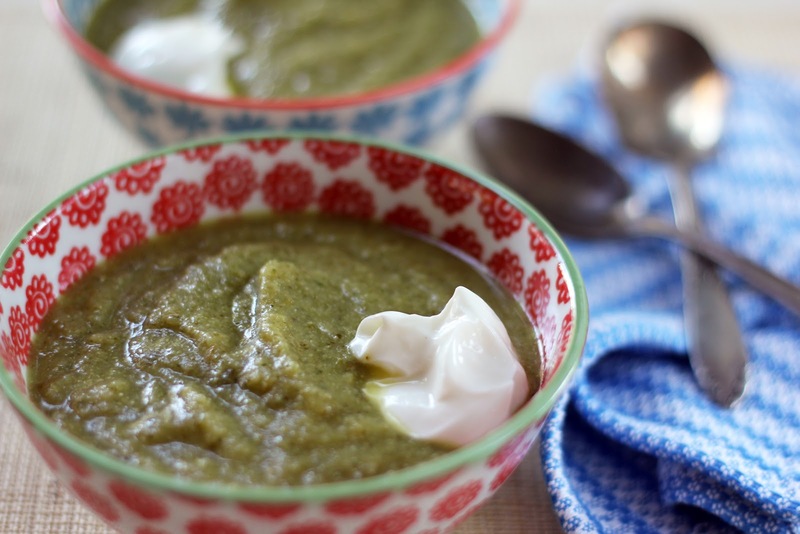 I recently discovered through Cook’s Illustrated that adding a handful of fresh spinach to broccoli soup pumps up the broccoli flavor and results in a more vivid green color, so I’ve added some spinach to the recipe, too. Simple ingredients - broccoli, apples, onions, butter and broth - create a satisfying, hearty, comforting meal. You can use any variety of apples you like, just keep in mind they will affect how sweet or tart your soup becomes. I used Aurora apples this last time, crisp with a nice bit of sweetness, and they were quite good. A swirl of thick yogurt to finish adds tangy flavor and rounds out the earthy sweetness. It’s getting dark early now (4:30pm! ), so I see a lot of soup in the coming months, preferably sipped by a fire with a cozy blanket. 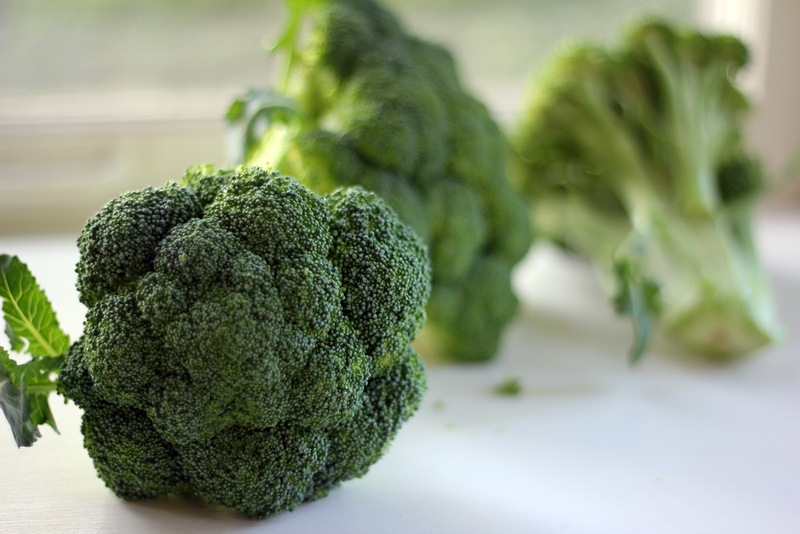 Cut the broccoli florets off the stalk and set aside. Cut the stalks into 1-inch pieces. Peel the apples, core and cut into 1-inch pieces. In a large soup pot, melt the butter over medium heat. Add the onion and apple chunks. Saute about 6 minutes. Add the broth and the broccoli stalks. Bring the soup to a boil, reduce heat to low and cover. Simmer for 20 minutes. Add the broccoli florets to the soup and simmer for 5 more minutes. Remove from heat. 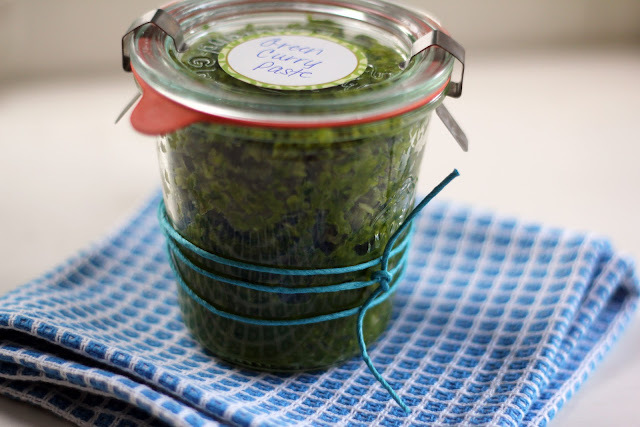 Toss in a generous handful of fresh spinach and stir. Using an immersion blender, puree the soup until smooth. Season with salt and pepper to taste. Garnish with a dollop of yogurt. 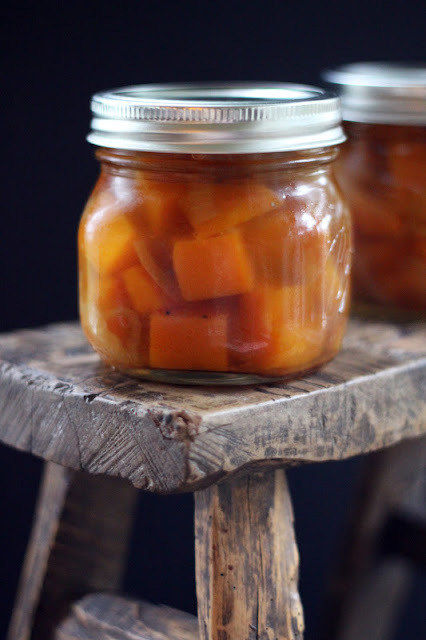 Over the summer, I flipped through Paul Virant’s The Preservation Kitchen while at my favorite cookbook shop and Butternut Squash Aigre-Doux jumped out. I love a new discovery and I decided on the spot that this had to be on my Thanksgiving menu. That was all the justification I needed to buy this gem of a book. Now, I didn’t actually know what an aigre-doux was, but anything with butternut squash is bound to taste good and I was curious. Aigre-doux is French for sour-sweet, which is always a delightful combination that catches my attention. Fruit or vegetables (think blueberries, asparagus, cranberries or cipollini onions) are cooked with wine, vinegar, sugar and seasonings and transform into something that will make your taste buds tingle. For this aigre-doux, butternut squash is simmered with sweet onion, maple syrup, wine and vinegar. The original recipe calls for sherry and sherry vinegar, but I used white wine and white wine vinegar instead. As the rain poured outside, my kitchen filled with a delicious scent from the bubbling pot and all was warm and cozy. When I took my first nibble of squash, it was one of those “oh wow, this is seriously good” moments. The squash is sweet, but not overly so due to the bright acidity of the vinegar. Paul Virant recommends cooking the finished aigre-doux down a bit to form a glaze on the squash and serving it warm on your Thanksgiving table. I will! And I have already served it with soft goat cheese and toasted baguette slices - really, a wonderful combination of flavors and unique way to enjoy butternut squash. Wishing all of you a warm, happy Thanksgiving holiday this week! Have 4 clean pint jars ready. In a large pot, stir together the squash, onion, wine, maple syrup, salt and pepper. Cover the pot and bring to a boil over medium-high heat. Lower heat to a simmer and cook until squash is fork tender, about 15 minutes. 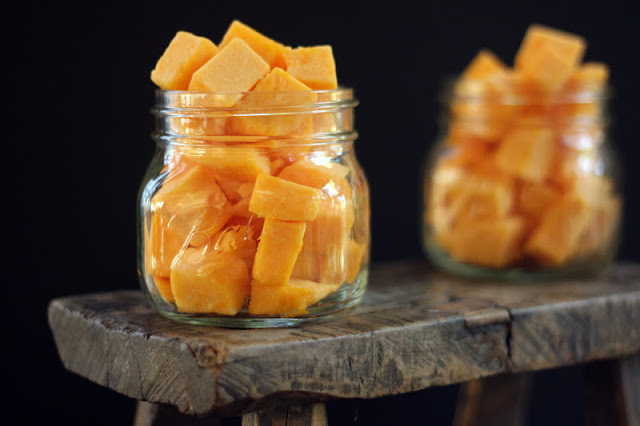 Using a slotted spoon, scoop the squash pieces out and fill the jars. Add the vinegar to the brine left in the pot and bring to a simmer. Carefully pour the liquid into a heat proof pitcher and pour the brine over the squash in each jar, leaving 1/2 inch space at the top. Push the squash down a little to see if you can add more. You may have some brine leftover and can discard it. Screw the lids on the jars. 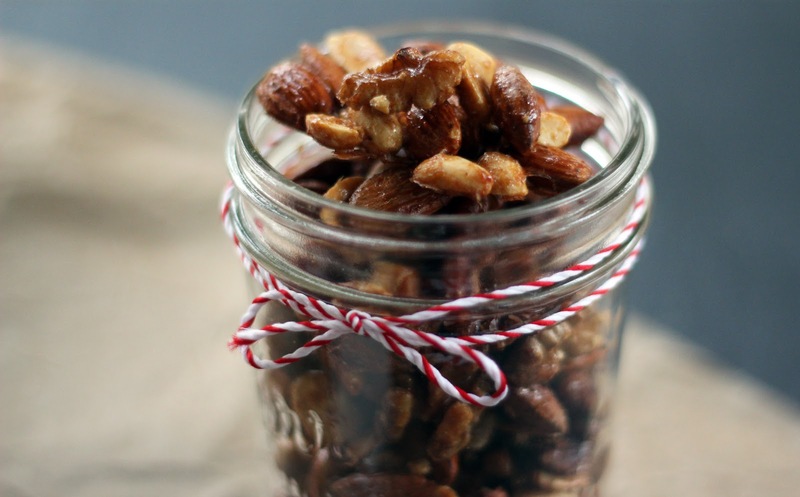 Pop the jars in the fridge where they will keep up to one month, but you'll gobble them up before that! When planning the Thanksgiving feast (or any festive meal for that matter), I often skip over the actual dinner part and think about dessert first. From there, I work backwards to choosing the main course, sides and appetizers. I love to bake, and dessert offers the opportunity to pull out cake tins, sifters, pie plates and rolling pins. While I like to add one or two new treats to our Thanksgiving dessert buffet (check out this Pumpkin-Chocolate Torte I’m making), I do appreciate tradition and I adore pumpkin pie. One can never have too much pumpkin pie in my opinion. 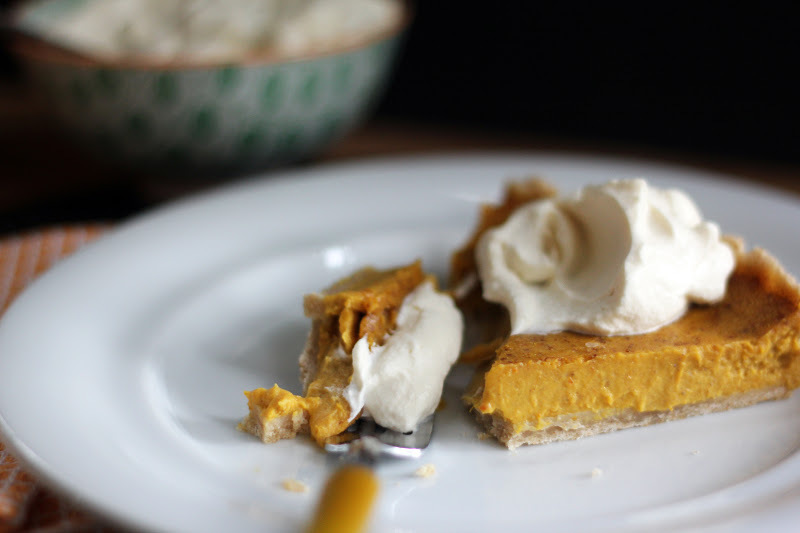 Growing up, I ate my slices of pumpkin pie by skimming the filling off in layers with my fork to make it last longer, saving the crust for last – I can safely say I’ve loved pastry my whole life! 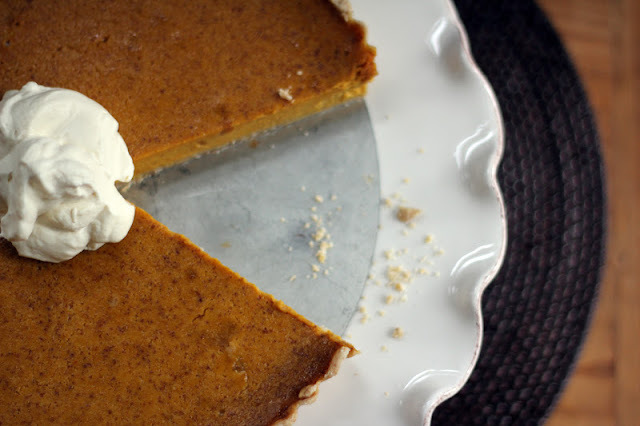 I prefer to keep my pumpkin pie simple, with just a hint of cinnamon and ginger. As much as I enjoy autumn spices, I like to taste the pumpkin and find it’s often lost in cloves and allspice. 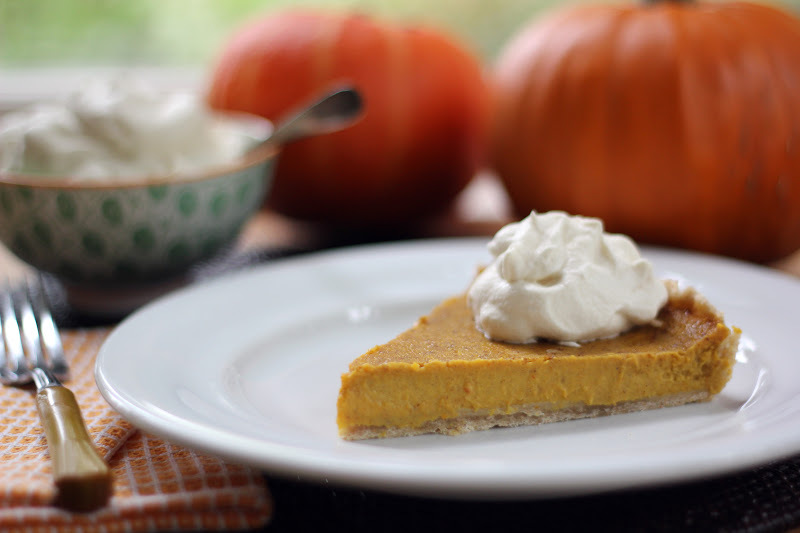 Pumpkin pie is an American classic. It tastes of holidays, family, warmth and comfort. We discovered through some of our exchange students that pumpkin is often an acquired taste (along with root beer and peanut butter). Creamy, maple sweetened pumpkin custard wrapped in a rich, buttery crust gets my taste buds tingling. And whipped cream is a must – it’s a beautiful sight to see clouds of cream mounded on top of the pie (keep the bowl nearby to dollop on more). This is Sam’s favorite pie and I must say I can happily eat it year-round. I’m most delighted when I discover leftovers the next morning and can cozy up with a slice for breakfast. To make the pastry, combine the flour and salt in the bowl of a food processor. Pulse a few times to combine. Add the chilled butter pieces and pulse until the butter breaks up into little pieces. Add 3 tablespoons of ice water and pulse to blend. If the dough does not begin to hold together when a small amount is squeezed, add 1 more tablespoon. Turn the dough out onto a piece of parchment paper. Press into a flat disc, wrap up and pop in the fridge to chill while you prepare the filling. In a mixing bowl, stir together the pumpkin puree, 1 cup of cream, eggs, 1/2 cup maple syrup, ginger and cinnamon. Set aside. Preheat oven to 400 degrees. Have ready a 9 inch pie plate or tart pan. Remove the pie dough from the fridge. Open the parchment paper and lay another piece of parchment paper over the dough. Roll the dough into a round to fit our pan (remember to roll in a few directions, then move the dough around so you are rolling evenly). Peel the top sheet of paper off and, using the bottom sheet, gently invert the dough into your pan. Press in and smooth to fit and remove parchment. If you’d like, crimp the edges in a decorative way. Fill the crust with the pumpkin filling. 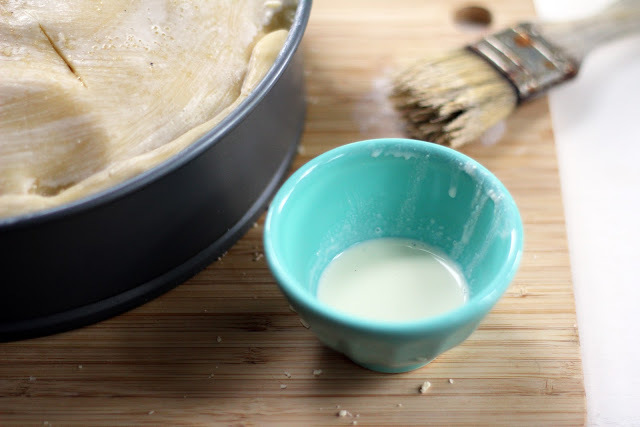 Place the pie plate on a rimmed baking dish and pop it in the oven. Bake until the custard is set, about 30-40 minutes (it should be a bit jiggly). Remove and let cool. Serve room temperature, or chill for up to a day before serving. When ready to serve, whip the chilled cream with the remaining 2 tablespoons of maple syrup until soft peaks form. Dollop and eat! My dining room table is covered with cookbooks and old issues (sniff) of Gourmet magazine (love those Thanksgiving editions!). All are open to various recipes I have made in the past or want to try for this year’s Thanksgiving dinner. For a few evenings now I’ve had to gather the stacks and move them so we can eat dinner. The books then quickly return to spread out again as I make my menu and shopping list. So many tempting choices for this one festive meal ... why can’t Thanksgiving be eight days long like Hanukkah? I love trying creative twists on traditional favorites. 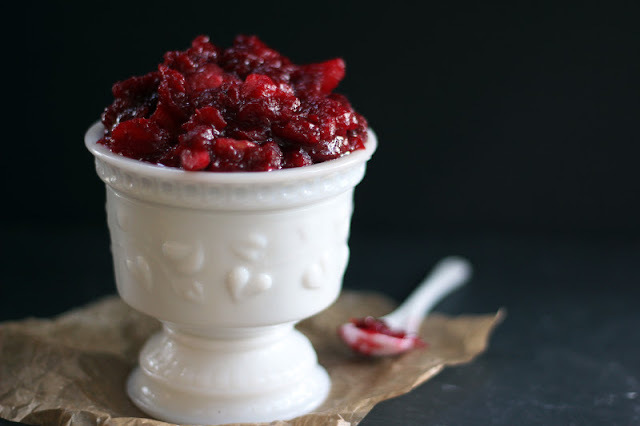 Cranberry sauce lends itself well to experimenting. Cooked or raw, spiced or simple, cranberries are amazingly versatile and it’s always fun to mix in different flavors and textures. Something new in my fridge are quinces that I picked up on impulse at the market. I haven’t cooked with quinces before and decided it was time. 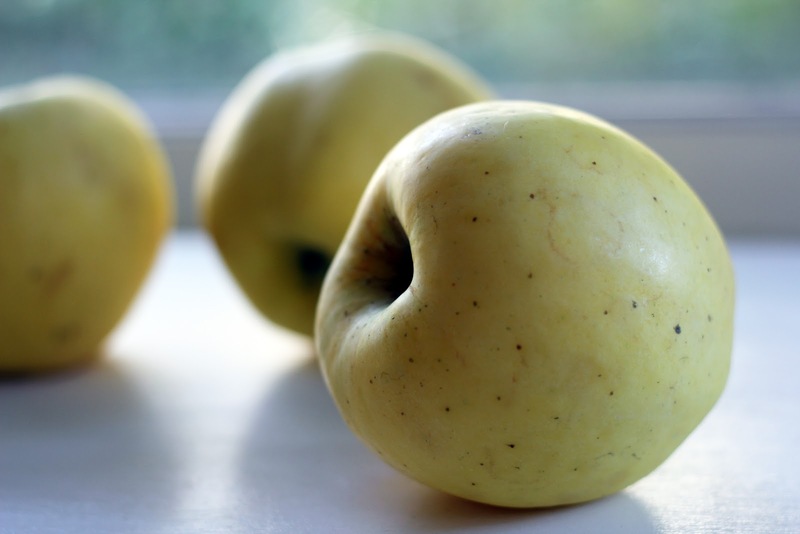 Quinces are in the same family as apples and pears, but unlike those the quince needs to be peeled and cooked first before eaten (according to what I’ve read, roasted, baked and poached are all good methods). The quince is hard and bland when raw, but when given some heat it transforms into a soft, floral, delicious fruit and the flesh becomes a rosy pink blush (they are high in pectin, as well, so I may try making quince jam this fall!). 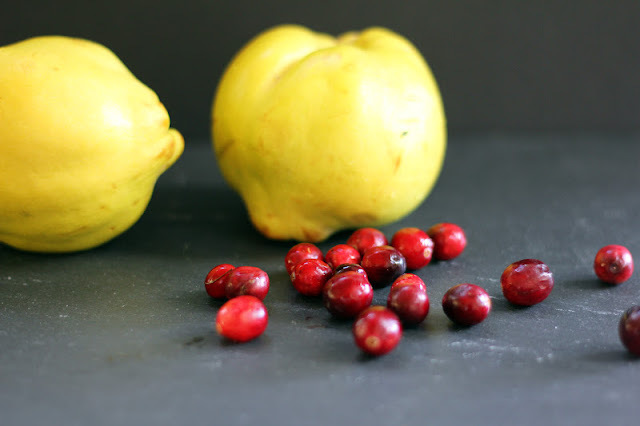 When simmered in apple cider, the chopped quinces became fragrant and sweet and I could easily have stopped there and spooned some over pancakes. But I wanted cranberry sauce, so I poured in my fresh cranberries, some honey and maple syrup and started stirring. 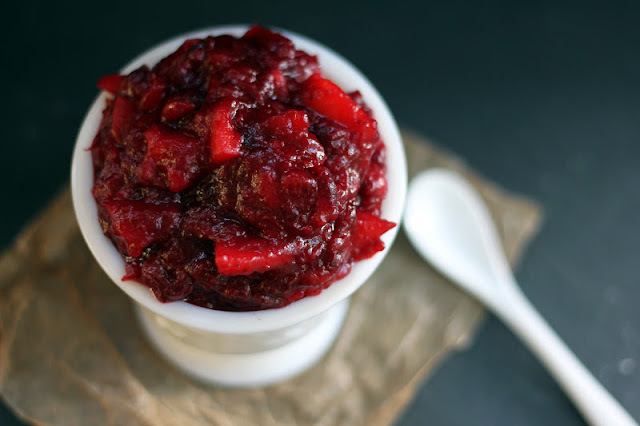 The lovely pop of cranberries soon began, and as they bubbled away a jewel-toned sauce emerged. I tasted a bit and was pleased with the results – tart with just the right touch of sweetness plus some added texture from the softened quince. This is a quick sauce to make and cranberry flavor shines. In addition to your Thanksgiving table (or your turkey sandwiches), this would be terrific adorning a cheese plate. In a medium sized sauce pan, combine the diced quince and apple cider and bring to a boil. Reduce the heat and simmer until the quince pieces are soft, about 8-10 minutes. Add the cranberries, honey and maple syrup and increase the heat to medium. Stir often and let cook until it thickens into a saucy texture, about 10-15 minutes. You’ll hear the lovely pop of cranberries! Watch closely to make sure it doesn’t start to stick or burn and lower heat if necessary. I like to make sure some of the cranberries stay whole for added texture. Remove from heat and let cool. Keep in the fridge for up to a week. It’s November! Which means I am thinking about Thanksgiving. I love to host, and this year we have lots of family coming to town. I can’t wait! Thanksgiving dinner is incredibly comforting to me. The familiar dishes that I make and eat during this time of year evoke special memories of childhood holiday dinners and now my own family feasts ... cranberry bread, corn pudding, trays of black olives and gherkins, turkey and, of course, pumpkin pie – I can never get enough pie! In addition to our traditional menu, I like to add a little something new each year, such as a creative twist on cranberry sauce or stuffing. 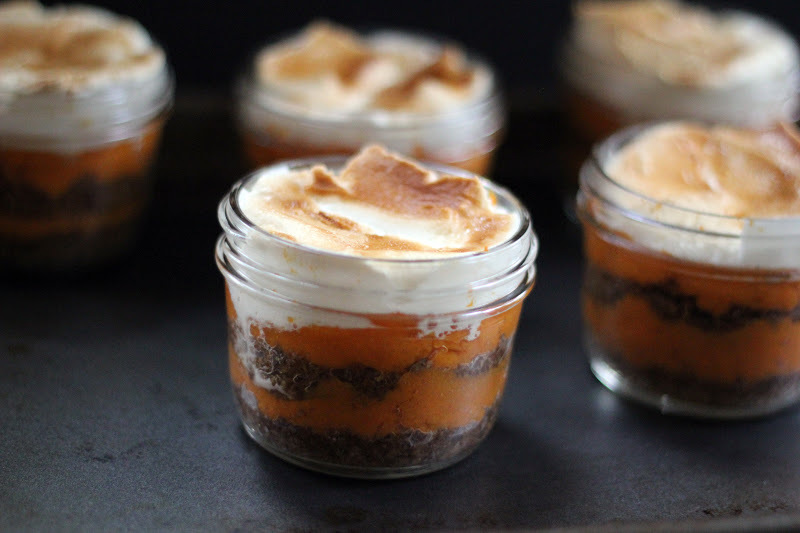 This year, I have in mind a riff on the sweet potatoes of my youth – a parfait if you will. 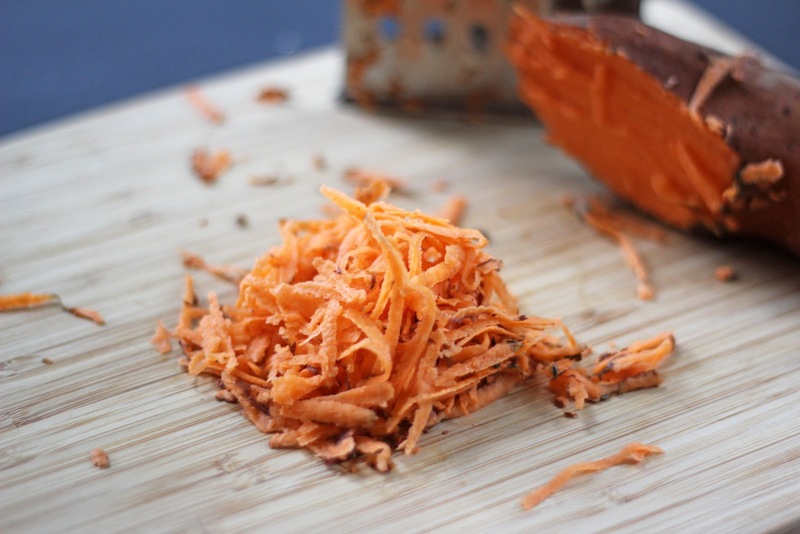 Sweet potatoes are loaded with healthy nutrients and extremely tasty, so we eat them year-round. When Thanksgiving arrives, though, nothing beats indulging in sweet potatoes with soft, melting marshmallows and a golden, toasty top ... just the way I had growing up. Brown sugar intensified the creamy sweetness of the potatoes and crunchy pecans added texture and nutty flavor. With these ingredients in mind, I created individual parfaits. 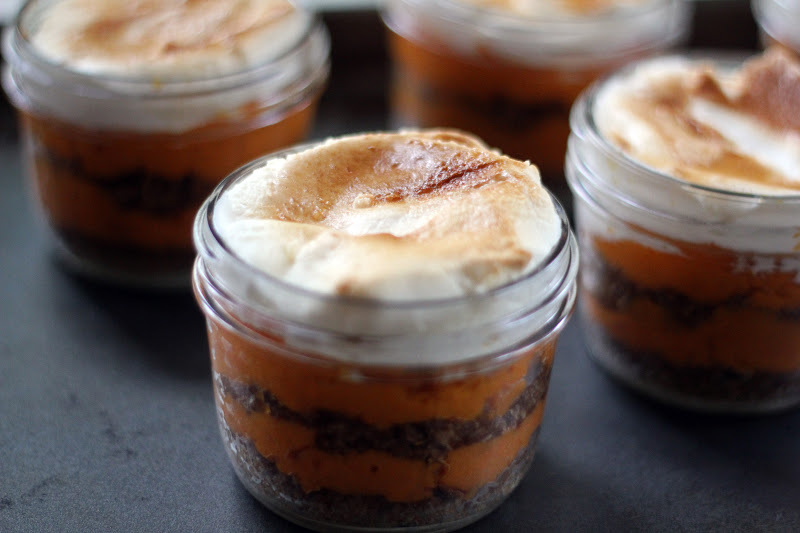 Maple syrup sweetened sweet potatoes are layered with cinnamon spiced pecans and then topped with gooey, toasty marshmallows. Making these in small jars or ramekins is quite festive and pretty and feels extra special. You could easily make this in one large baking dish, though. An added bonus is you can make these ahead of time (handy to have the jar lids to use as covers), and then top with the marshmallows at the last minute and pop under the broiler. 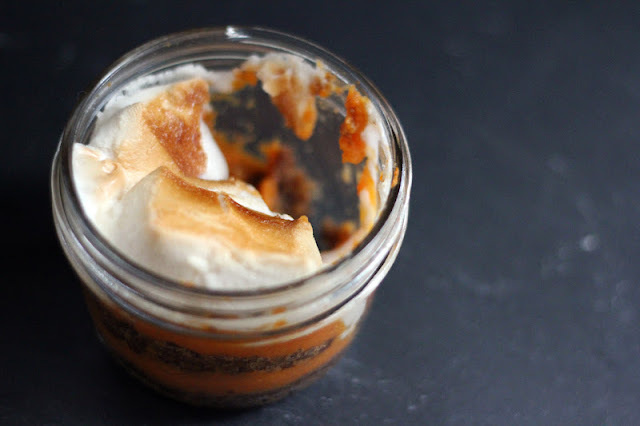 Your spoon will shatter the crunchy marshmallow top and slip into a sweet little pot of fall flavors ... pure nostalgia. Have five small jars or ramekins ready to fill. Scoop the sweet potato flesh out into a medium sized bowl. Mash until soft. Add the maple syrup and one teaspoon of kosher salt. Stir until well mixed and set aside. Combine the cooled pecans, cinnamon, butter and 1/2 teaspoon kosher salt in the bowl of a food processor. Pulse until the nuts are finely ground and ingredients combined. 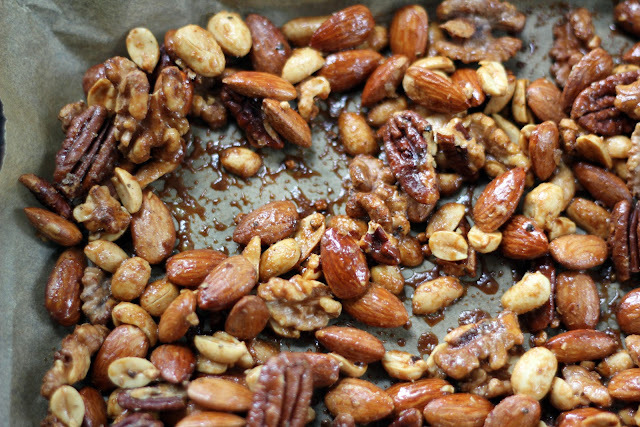 In each little dish, spoon in two generous tablespoons of the nut mixture and lightly press down to smooth. 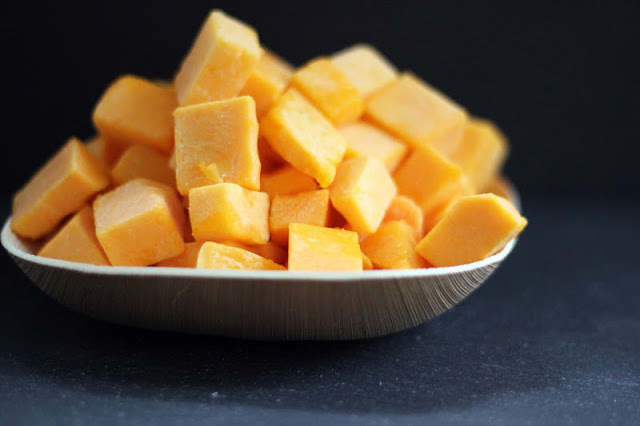 Add two to three tablespoons of sweet potatoes and smooth to layer. Repeat the process (you should have two layers of each). At this point, you can set aside to finish later in the day or cover and chill for serving the next day. When ready to serve, preheat oven to 350 degrees. 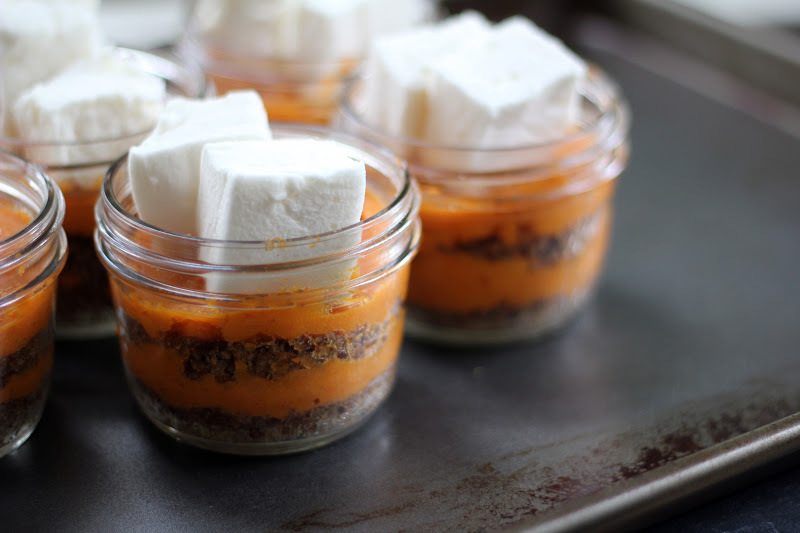 Place jars on a baking sheet and top each serving with two marshmallows. Bake for about 8-10 minutes, until the marshmallows start melting and the sweet potatoes are warm. Flip on the broiler and watch closely until the marshmallow tops are golden brown and crisp. 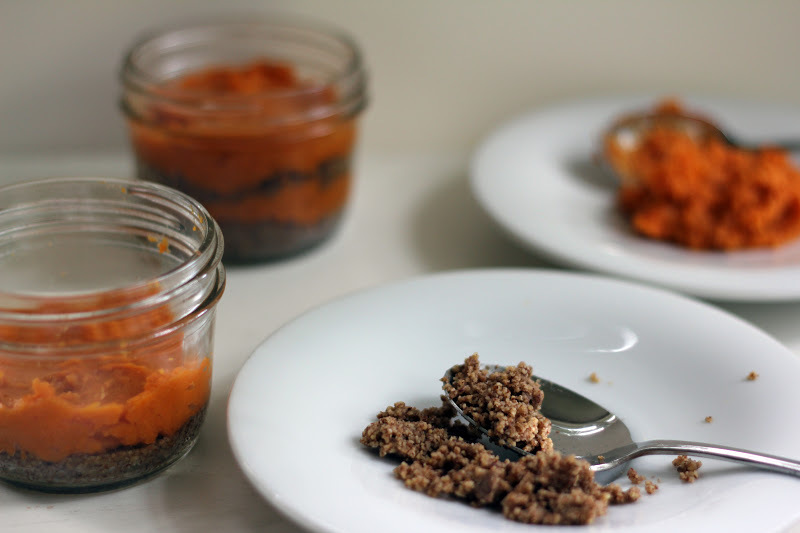 Remove and serve (jars will be hot, so place on small plates or saucers).